Jade Glass Award Beveled Triangle with Aluminum Pole 3/16" thick. Cardboard gift box included. 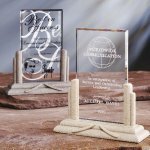 Jade Glass Award Beveled Vertical Rectangle with Aluminum Pole 3/16" thick. Cardboard gift box included. This original Acrylic Award is a modern classic! The Beveled Wedge is hand crafted from the finest acrylic and polished to perfection. It features faceted contours and bevels to give it its sleek modern appearance. 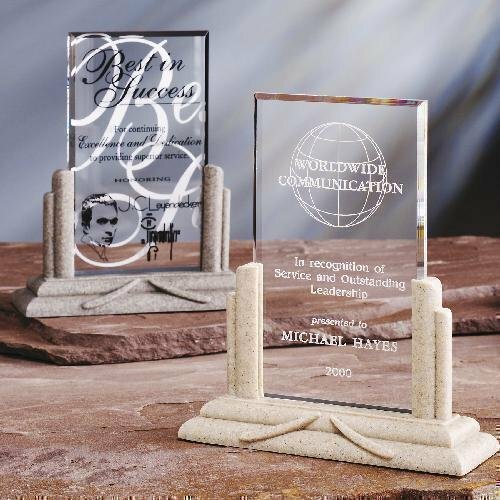 This product is a great award for any commemorative event. Available in two sizes and your choice of blue, red, green, gold or purple reflective bottoms. Pure K9 premium optic crystal award with beautiful contour. The front of the award is slightly rounded with the back is completely flat for engraving.